TAMPA, FL, UNITED STATES, September 26, 2018 /EINPresswire.com/ — TAMPA, Fla., September 26th, 2018 —The National Christian Foundation Tampa Bay—an affiliate of the National Christian Foundation (NCF), the 8th largest charity in the United States with over $12 Billion dollars of charitable gift contribution experience—welcomes all financial advisors, planners, CPAs, Attorneys, and Development Officers to attend the 6th Annual Plan to Give Conference. The event will be at the Palma Ceia Golf and Country Club on Wednesday, November 7th from 7:30am to 11:45am, will feature nationally renowned speakers, and 3 hours of CE credit. Cathy Sheffield is a fundraising executive with over 24 years’ experience, specializing in major gifts and gift planning. She is President of ThinkGiving, a consulting firm based in Fort Worth, Texas, which specializes in strategic philanthropy for nonprofits and individuals and in providing leadership and comprehensive major and planned gift consulting services to nonprofit organizations of all sizes. Cathy is also a Vice President with Thompson & Associates, offering estate planning services to nonprofits. She will be speaking on Blended Gift Opportunities. Greg Sperry is the Executive Vice President of Gift Planning Services at the National Christian Foundation. In addition to offering gift planning information to donors and their advisors, for over twenty-five years Mr. Sperry has been a frequent presenter at seminars and charitable gift planning forums, focusing upon the tax, legal and stewardship aspects of gift planning. Given the sophistication of planning services and the ever-changing tax rules and regulations, Mr. Sperry is involved annually in The Heckerling Institute of Estate Planning in Orlando, as well as other conferences on planned giving and charitable giving techniques for his continuing education of current trends, analysis and techniques. Bob Doll is Chief Equity Strategist and Senior Portfolio Manager at Nuveen Asset Management. Bob manages the Large Cap Equity Series, consisting of nine strategies. He has 35 years of portfolio management experience, and regularly appears on CNBC, Bloomberg TV and Fox Business News discussing the economy and markets. 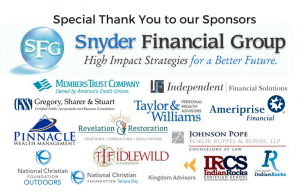 To inspire and educate financial professionals in the Tampa Bay area to champion the cause of generosity and philanthropy by serving their clients using advanced charitable planning techniques and timeless wisdom. For more information and registration, please visit our website: https://www.plantogiveconference.com/. Headquartered in Atlanta, Georgia, the National Christian Foundation (NCF) helps donors simplify the process of giving to their favorite charities and multiply the impact of their gifts through tax-wise strategies. Since 1982, NCF has become America’s largest sponsor of donor-advised funds for Christian givers with over $12 billion in contributions and more than $10 billion granted to thousands of churches, ministries, and non-profits.